Hamtaro: Princess of Vision(The Second Movie) Tottoko Hamutaro Movie: Ham-hams! The above info came from hamstarz, and was edited by yours truly (contact me). The image came from Hamtaro-Movie.com. 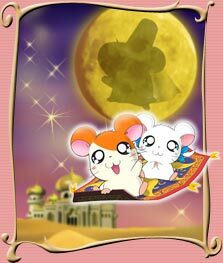 Hamtaro starts to have a dream about a desert, foreign land in the year 8686 of hamster calendars. In the dream a princess hamster named Saro-shina gives him a message. Suddenly all of the ham-hams are teleported to the foregin land in Hamtaro's dream. They have to reascue the Princess from an evil cat and his ram (male sheep), and protect this land.